The first time I ran into a Tommy Mel’s restaurant the first thing I did was ask if they had gluten free dishes. They didn’t. Recently I read this post saying they have gluten free food in their Valencia restaurant. 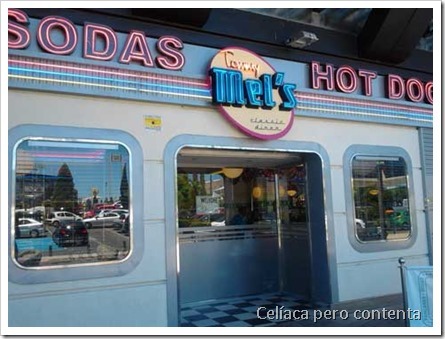 So the following weekend we went to a Tommy Mel’s located at the Equinoccio Mall in Majadahonda to check it out by myself. 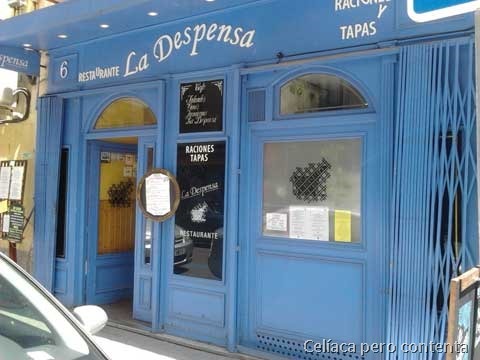 After reading a recommendation about La Despensa Restaurant on EstoSiPuedo‘s blog, I decided to go and try it. I liked it very much. It’s a family restaurant with home cooking kind of dishes. Small and cozy. 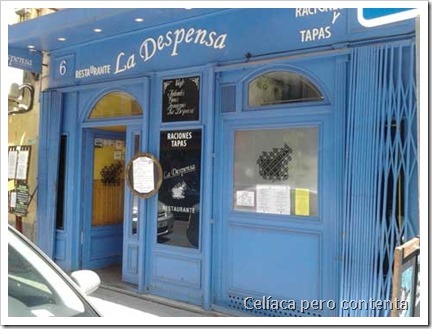 The place is run by the owners: Carmen and her son and daughters Arturo, Begoña and Carmen. On the weekend of June 15/16th we and other 4 gluten free bloggers had the honor to be invited to the first Gluten Free Blogtrip. In case you are wondering what the heck is a blogtrip, well, it’s a trip organized by a company or any other kind of organization who wants to promote their products, destinations or services so they invite a few bloggers to show them around expecting they later will blog about it. In this case we were invited to the city of Logroño in La Rioja by EcoDiet, a distributor of food for people with intolerances like gluten, lactose, egg and protein. 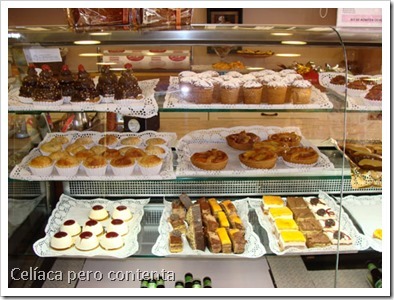 EcoDiet is based in Logroño and they sell products to all Spain. Well, it happens that Logroño is very well prepared for celiacs. Fancy lunch in the restaurant “De Perdidos al Rios”. 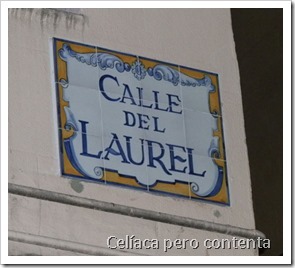 City tour of Logroño historic center. 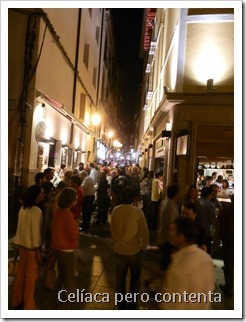 And in the evening (Spanish evening so we started at 22:30) the best part: gluten free tapas along Laurel street. Visit to the Franco-Española winery, which is right in the city. Really cool. Last weekend we attended SalAIA 2013 (Food Intolerance and Allergies Fair) in Madrid. As usual every year in this event we discovered some interesting gluten free products and producers. We also took this opportunity to talk to a our fellow bloggers and people related to the gluten-free lifestyle in Spain. Casual fruit is an interesting gluten-free fruit based snack. It’s lyophilised (freeze-dried) crunchy fruit pieces packed like a small bag of chips. Lyophilisation guarantees the total conservation of the fruits’ nutriments without any oil, added sugar, gluten or preservatives. 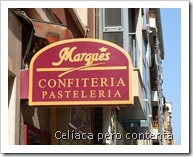 Finally on my recent trip to Asturias I could go to the famous Marqués Confectionery in Gijón. I say “finally” because I’ve known about it for a long time and I have tasted their delicious gluten-free products several times. I also met its owner Alejandro before, during an exhibition in Madrid. When I got there the first thing I noticed was the decoration, it’s so cute. It looks like a tea parlor. 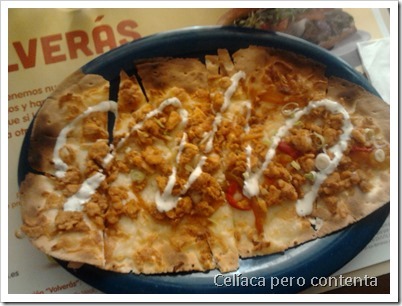 Alejandro Álvarez, the creator of this celiac paradise showed us the whole place. We saw the area where they prepare shipments and wrap gifts. Then he showed the kitchen where we met Carlos, the baker, working on “carbayones” (typical from Asturias). Everything in this confectionery is gluten-free, but there are also lactose, egg and nuts free products. After the kitchen tour it came the best part: tasting. Alejandro already had prepared a box of “Rocas de Almendras” (almond rocks) because he knew it’s my favorite. We also bought a few tuna turnovers that were to die for :-) We also had a couple of excellent apple pastries and a few other candy to go. We recently took a trip to Asturias and we planned to stop in León to take a look around, see the famous cathedral and so on. 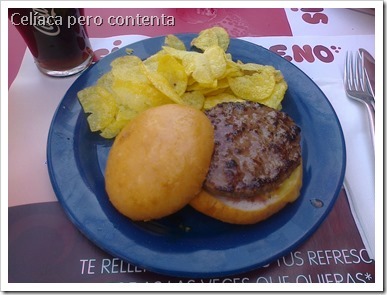 The first thing I did before leaving was browse around the web to find a restaurant in León with gluten-free food. 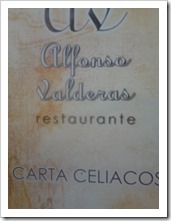 Among the options we found we decided for the restaurant “Alfonso Valderas”. It happened to be a delicious choice. Since VIPS has a gluten free menu I’ve been there a couple of times tasting the dishes. 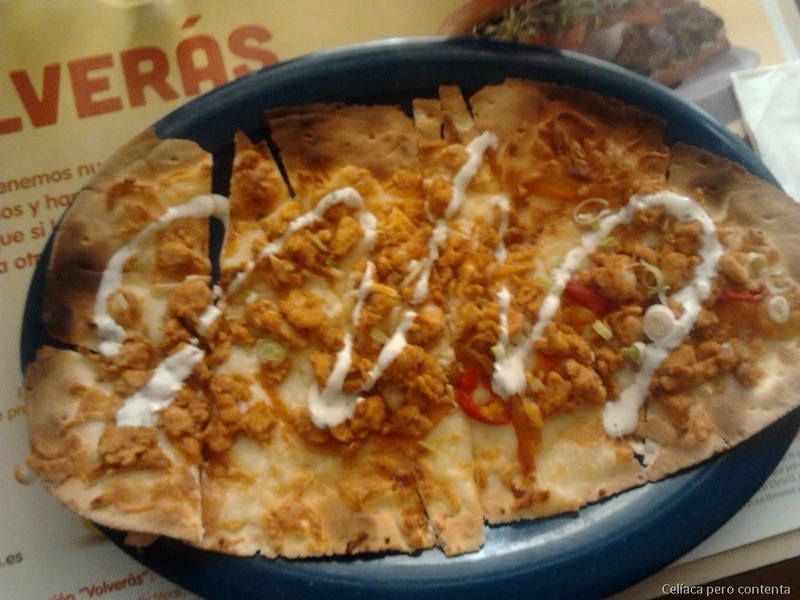 First I tried the “Flatbread de pollo” (Chicken flatbread). It’s like a pizza dough with chicken chunks and barbecue sauce. It was pretty good as a starter, maybe too big so it’s better for sharing. I wasn’t very hungry so I just had that. Another day I tried the Cheeseburger (the cheese is hidden under the meat ;-). The bread is quite similar to Mc Donald’s and I’d rather have it with french fries instead of chips but… well, the overall dish it’s good. 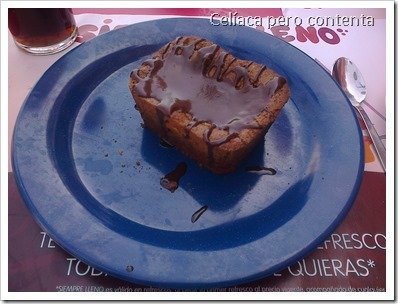 And for dessert a big big brownie, well at least for Spanish standards it’s huge. It’s covered with chocolate sauce and it’s coulant, meaning the core is “melted”. It was delicious. All gluten-free dishes are served on blue plates to distinguish them from the others. The VIPS Group has just announced that we can enjoy a gluten free menu in their Vips and Ginos. 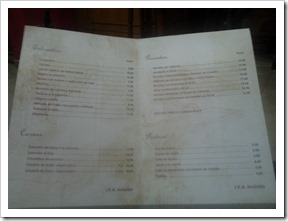 In the Vips case they have renewed the gluten free menu and it’s already available in its 93 restaurants. In the Ginos case they have created a new gluten free menu that is being implemented gradually in its 94 restaurants (currently is available in 18). The new menu includes gluten free starters, main courses, drinks and desserts. All these at the same price of regular dishes. VIPS Group have made a big effort to have these menus. They have remodeled kitchens, included ovens dedicated to gluten free food and use different plates to avoid the cross contamination. ¡Thanks to the VIPS Group! Before being diagnosed celiac, every now and then we felt like eating out good and cheap. 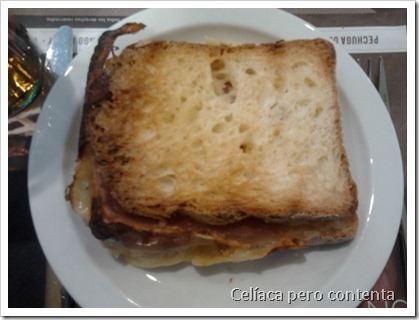 One of the places we used to go was 100 Montaditos (“mini” baked bread sandwiches restaurant chain with a menu of 100 type of sandwiches). Well, that’s not an option anymore because they don’t have any gluten-free option. 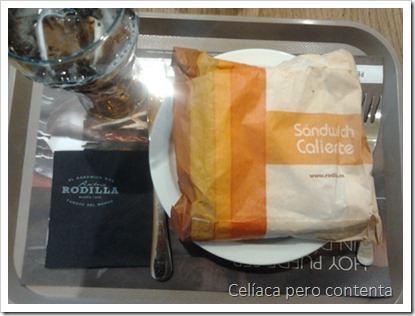 Now we have an alternative: Rodilla, which is another sandwich restaurant chain, recently launched a gluten-free ham and cheese warm sandwich that it’s individually stored, warmed and served packaged. It’s a pity that there is only one (ham and cheese) but at least it’s pretty good. According to my non-celiac husband the bread was better than the regular one he was having. So thanks to Rodilla and we hope you will extend your gluten-free options soon. Have any one out there taste it? How do you like it?. Please let us know in the comments.